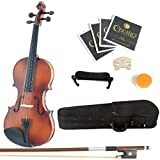 Mendini 4/4 MV300 Solid Wood Satin Antique Violin with Hard Case, Shoulder Rest, Bow, Rosin and Extra Strings (Full Size) (UPC 847848013003) is sold at the following online stores. We've find the latest prices so you can compare prices and save money when making your purchases online. Please click on the links below to browse to each store's webpage.